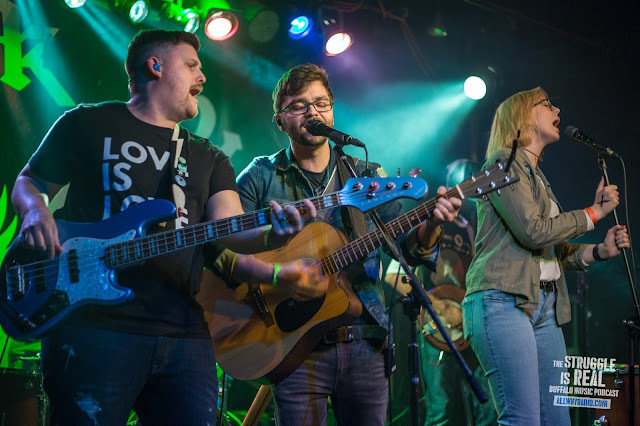 On March 3, 2018, a frigid Monday night in Buffalo, a smattering of people made it out to Mohawk Place to catch an evening of music headlined by Tennessee-based Coopertheband. While attendance was low, the crowd was treated to a fun night with three local openers. Paragon kicked the evening off the evening. They are a four-piece power pop group that combines long instrument breakdowns with big, bombastic song writing. Their Goo Goo Dolls-eqsue anthems provided an exciting, energetic start to the night. Urban Planning’s moody brand of spacy pop came second. The earnest, frankly delivered vocals remind me of seeing punk legends The Smoking Popes a few months ago. They combine those vocals with atmospheric, jangly power pop. Not other band in Buffalo sounds quite like them. The rock-and-roll falsetto made an appearance and hung around for too long, but overall, it was an excellent performance. Avidd the Band played third. A family emergency left them down a bass player, resulting in an acoustic set. Vocalist/guitarist Lexxi Himes and company gave it a solid go, including delivering a fun cover of Rihanna’s “Umbrella,” but Himes’s voice is definitely better served with a full band behind her. Coopertheband closed out by warming up the chilly venue with a set that mixed rock, country, folk, Americana and soul. Vocalists Cooper Brown and Phoebe Scott emanated energy the second they got on stage. The whole band sounds incredibly tight, but it’s Brown and Scott’s vocal harmonies and charisma that propel them forward. Scott, with a look, energy and charisma reminiscent of stage presence of Debbie Harry, has a powerful, booming voice, a counterpoint to Brown’s precise, smooth tenor. Highlights from the set included “Rebels” and “Invisible Man” (with a breakdown into “Pumped Up Kicks”), both of off their 2017 album Kingdoms. The whole band was tremendous and looked like they were having a blast. Hopefully, we’ll see Coopertheband again soon. With music already featured on ESPN, HBO and Without a Trace, they seem destined for long-term success. Hopefully next time they come, it won’t be so chilly and we’ll see a big crowd out to watch this impressive band on the rise.